The mountains were calling, so we followed the long roads through plains, marshlands, wide rivers and tiny towns toward snowy peaks and much needed cold weather. We were able to cover one country in a day while in Central America, so in our minds the great size of South America wasn't clear yet. It took way more than we imagined to get from Cartagena to Bucaramanga, and even more to Chicamocha Canyon, since Google Maps doesn't take in consideration that we drive even slower when its raining while we go through switchbacks crowded by giant trucks. Our first stop was a lovely camping spot, we got there late and basically stopped traffic at the end of the switchbacks closest to the top because the angle to go in was extremely tight, it wasn't fun. The next morning we woke up to breathtaking views of the canyon, and the best arepas(traditional tortilla like paddy made of cornflour) we had in all Colombia. It felt great to wake up under the duvet feeling the crisp air of the morning and the sun warming up the day slowly. There is two ways of exploring the Canyon, by land or by air, we decided to take the latter since it has been in my bucket list for many years. Paragliding up in the sky like a bird was exhilarating, mind blowing, and a bit scary, but seeing the world from up there was more than incredible. We headed to Barichara, a very famous, very pretty, not extremely touristy town in Santander, but we stopped first in San Gil hoping we could park for a bit. We didn't count on its streets being so narrow and mostly one way, which made us hurry through there, not without stopping at a popular park called El Gallineral. This park is next to the Rio Fonce so there's a nice, refreshing breeze, the trees are magical, the paths are quiet and there's a mystique to the place that makes you feel like in a fairy tale. The road to Barichara from San Gil is easy and pretty, we were there in no time. The minute we cruised through the cobblestone streets and saw the pretty houses with red tiles, we fell in love. There were so many little streets to explore, plazas and churches, restaurants, and there was even a public pool to cool off in during the hot days, cause believe it or not, it was cold at night but pretty hot during the day. Isn't that a pretty little church? The best part of it all is that we got to camp and explore this lovely town with our good friends John and Mandi. We hiked together the Camino Real towards Guane, a hike filled with fossils everywhere you look, we cooked meals together, went out for breakfast, cappuccinos, ice cream, dinner, I guess we actually barely cooked, but over all had an amazing time. It was hard to leave the area but time was rolling so we needed to keep moving too. It was a long ride towards Cocuy National Park, but we enjoyed it. We arrived in the town of Cocuy to spend a couple days acclimating to the high altitude and learning about the park's new routes. The town is all painted in white with green doors and windows, it has won an award for the prettiest town in Boyaca more than once and that's easily understandable. This National Park was closed for almost a year, and it had just recently opened when we arrived(Oct 2017). Before this, it was possible to do a 7-day guided hike through glaciers, bringing horses, food, tents and all the necessary items for a week in the highlands. Currently there's only three 1-day hikes allowed, with a mandatory guide from the area and special insurance for high altitude for each day that you plan to spend in the park. We met again with our friends John and Mandi on our second day in town, spent one more night and drove a bit higher to keep getting our bodies used to the the thin air. We arrived to an old Rancho at the trail-head where we camped for the night, we made soup and went to bed early. The next morning was gorgeous and sunny so as weird as it sounds, we decided to do a load of laundry, and when I say a load of laundry I mean a load in my red bucket, washed by hand. Also when I say we decided I really mean we had no option cause we were running out of socks and underwear. The altitude was not really affecting us and we were feeling pretty good so we were almost ready to do the first hike. Unfortunately it was a different story with our friends, Mandi was not feeling great so they decided to head back to town and see if the situation improved. We on the other hand, naively wanted to do the three hikes, not knowing yet that was a very ambitious plan. Information about this park is a bit confusing and completely wrong (at the time) in our Lonley Planet. The easiest way is to go to the park yourself or read the National Park's web site if you know Spanish. But I will break down how we did it. Take into consideration that we travel slowly and like to take our time if possible, which is best for acclimating in high altitudes. There are 2 towns where you can arrive first: Güican(2983m) and Cocuy(2700m), in both places you can find a tourist office where you can learn about the hikes, pay to enter the park, and find a local guide. Be aware that there's a list of guides with phone numbers to contact them but most of them do not speak English, and no one working at the Tourist office is allowed to recommend a guide because of some bureaucratic issues, so still ask if they know of someone that speaks your language but don't be surprised if they don't answer. There's also an insurance office available in both towns. The issue is, what if you pay for everything and then you have altitude sickness and can't do the hikes? Because of this dilemma we drove to the town of Cocuy, slept there for three nights, then drove to Hacienda La Esperanza which is at the trail-head of Pulpito del Diablo hike, spent two nights there and then drove to Güican once we were sure we felt fine at that altitude. We paid our entry fee which gave us five days to be in the park. We hired a guide for the first hike and payed for three days of insurance for each of us(about $3 per day per person). 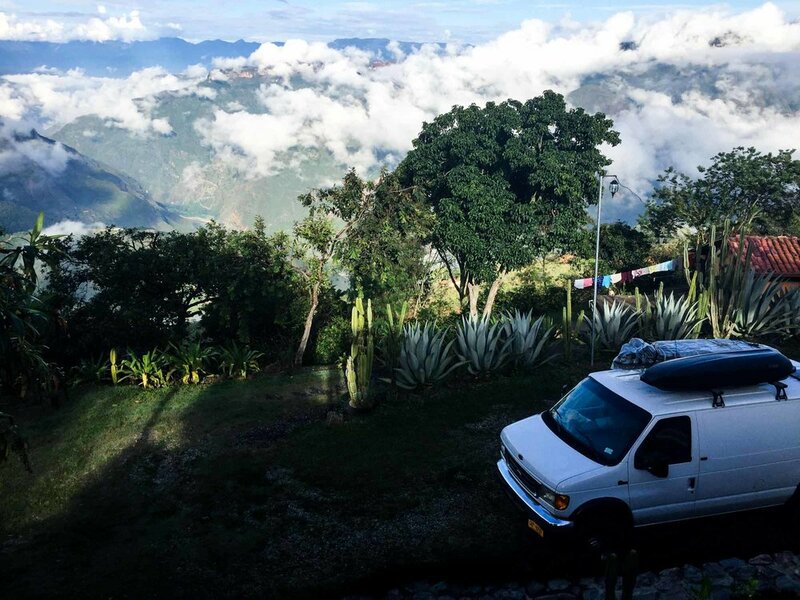 We drove toward Posada de la Sierra Nevada at the trail-head of the Ritacuba Blanco hike and slept in our van to start early the next day. We looped around a bit more than we anticipated but it worked out to be the best way for us, we had a full tank of gas and plenty of food so we had no issues doing it this way. Have in consideration that you can't camp while on the trails but you can sleep in your van or at the few places inside the park without a problem, just be prepared for very cold nights. We started early, ready to climb from 4000m to 5000m high to the snow line. The air was thin in oxygen and it was a difficult but extremely beautiful hike. At first there was still plenty of vegetation, the frailejones, a classic alien-looking plant that grows in the Paramo, was present constantly. Slowly but surely the terrain became harsher, with more rocks, less plants, and every step felt heavier and slower. Clouds and fog were dancing over our heads all the time till finally we saw some clear blue sky and there it was: the snow line, the pristine, white, untouched, perfect blanket of snow. We learned from our guide about the troubles of the park and why it was closed for one year. The Uwa, a group of indigenous people that live in the area consider the snow sacred. The park had been accepting more people than it could really handle with 7-day hikes which brought garbage and disrespect to a sacred place. Guides and insurance weren't mandatory causing big risks to the hikers. And the money collected from the park was not staying in the communities. It seems a lot of tourists were upset about the restrictions, but if you really care about the environment and wish to preserve it, this was the right thing to do. We stayed up top just long enough to see the blue sky disappear and eat some snacks. On my second step down I felt a little bit of pain in my knee, I don't know why I though the way down would be easier, it was way more difficult. The pain on my knee became worse and worse, by the time we were 1km before camp, I was limping. It was only 7kms and definitely the first time I felt that kind of pain. I guess the body aches more as we age and now that I am 36, I have to be mindful of my strengths and weaknesses. I have done many hikes since then, much longer hikes, but now I wear a knee brace and bring a hiking pole. Oh well, at least I haven't been in that kind of pain again. Our plan was to hike that morning and then leave, but as you may know, plans never go as you wish. We were so exhausted... there was no way we could drive anywhere that afternoon. Our guide left on his motorbike like if he had gone for a a short walk just for fun, he was going to meet his friends for a beer and he was not tired at all. I felt jealous for a minute, as I crawled into my bed to warm up my achy body. We went to bed at 7pm and slept all the way till the next morning. **NOTE: we haven't post anything since we got robbed in Ecuador 4 months ago, sorry for the delay and the lack of photos. We are getting back at it thanks to your support!